Pushed Out, a Michigan Radio investigative documentary, analyzes the continued fallout of the housing crisis in Grand Rapids. 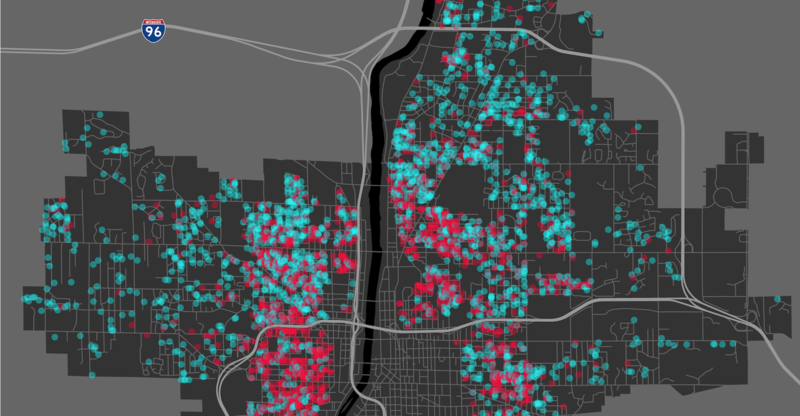 See visuals of Michigan Radio's property data analysis below. Michigan was hit hard by the foreclosure crisis. But now, almost nine years after the crash, the state's housing market is showing promising signs of life. That's especially true in Grand Rapids, which has one of the hottest real estate markets in the nation. But while some see a city on the rise, others see long-time residents getting pushed out. So the question is: Who is actually benefiting from the housing boom? 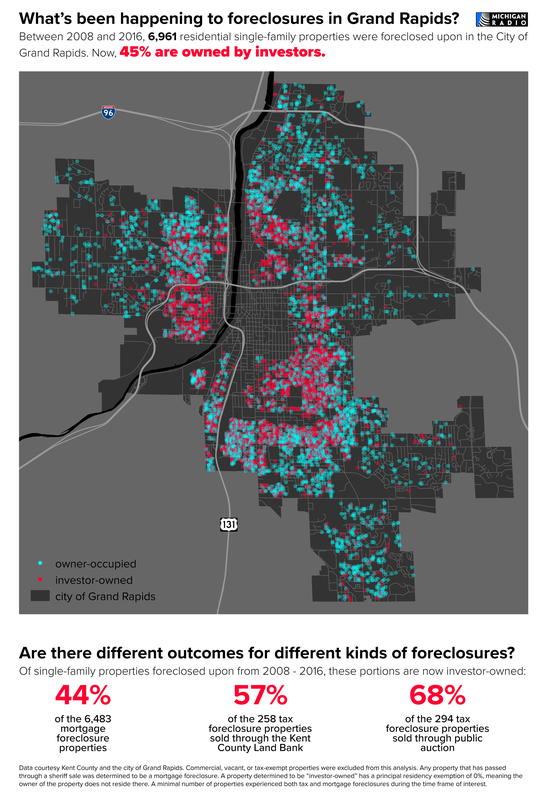 A Michigan Radio analysis of property records shows of all the occupied single-family homes in the city of Grand Rapids that went through some sort of foreclosure between 2008 and 2016, 45% are now owned by investors. Over 15% of single-family homes in Grand Rapids have been foreclosed since 2008. Nearly half of those are now owned by investors. Click image to enlarge. 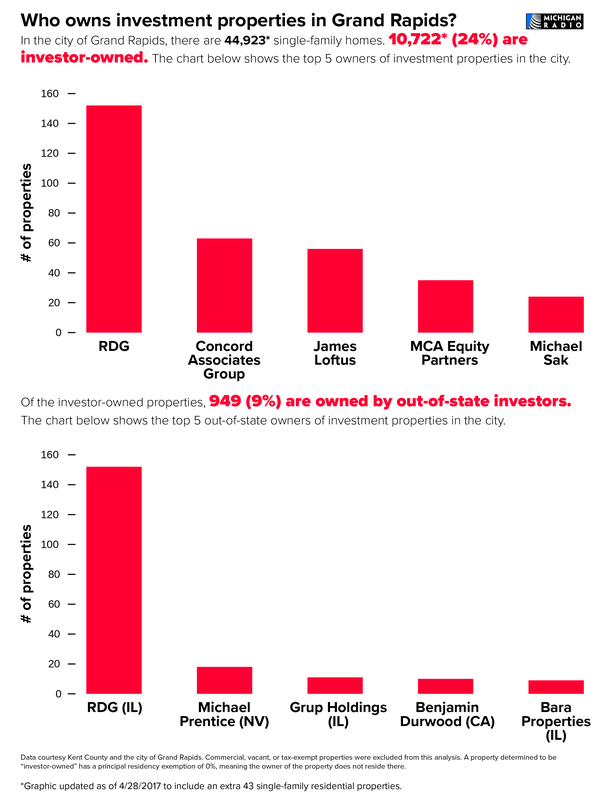 Of all occupied single-family homes in the city, nearly a quarter are now owned by investors like RDG and Concord Associates Group. All the investor interest in the city has helped drive up housing prices. Within the last year, the realty company Zillow reports home prices within the city limits rose 11%. In some neighborhoods, rents rose as much as 18%. That's bad news for renters with limited income, but good news for the investors who bought up foreclosed properties at rock-bottom prices during the housing crash. Investment groups like RDG have been buying up properties throughout Grand Rapids, driving up prices. Click image to enlarge. Tune in today for an in-depth look at the winners and losers in Grand Rapids' housing market in Pushed Out from State of Opportunity's Dustin Dwyer. The hour-long documentary airs at 3 p.m. and again at 10 p.m. on Michigan Radio. These numbers have been updated to correct a discrepancy in the city assessors’ records provided to Michigan Radio. This update does not affect any of the percentages originally reported. You can download our table of investor-owned properties here.